'It means so much to me that this is my first show as Associate Artistic Director. Beatrice Basso had studied Classics and Theater in her native Italy before moving to America and living in California. Then, as Long Wharf Theatre's dramaturg and literary manager from 2004 to 2008, she developed a passion for new work and by 2009 had returned west to be a part-time artistic consultant at ACT and full-time tamer of Rucker's Petruchio at home. Marco Barricelli had left ACT's core company in 2005 to work again in New York, and be closer to Basso in New Haven [ 31 ]. In 2008 they returned to California where Barricelli, like Michael Edwards and Danny Scheie before him, became Artistic Director of Shakespeare Santa Cruz. 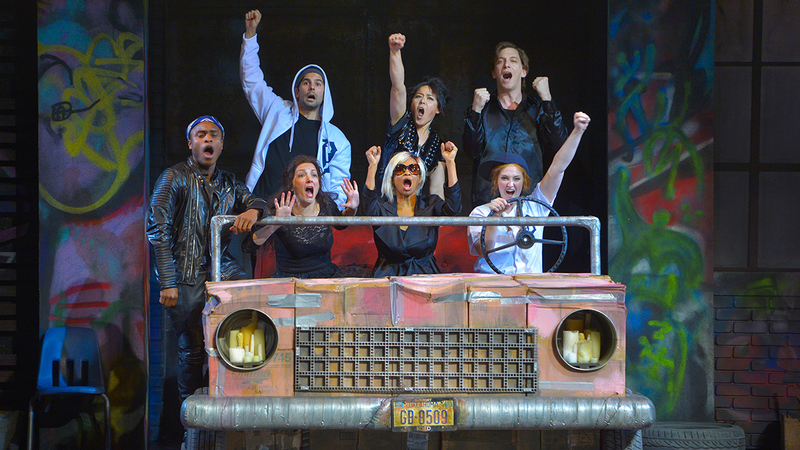 In 2009, when Basso began commuting from Santa Cruz to ACT two or three times a week, "concentrating on new work and finding new work for the students and the company," Rucker was increasingly present in the theater offices. He was engaged in a variety of artistic, producing and administrative projects in the lead-up to being named ACT's Associate Artistic Director the following year. 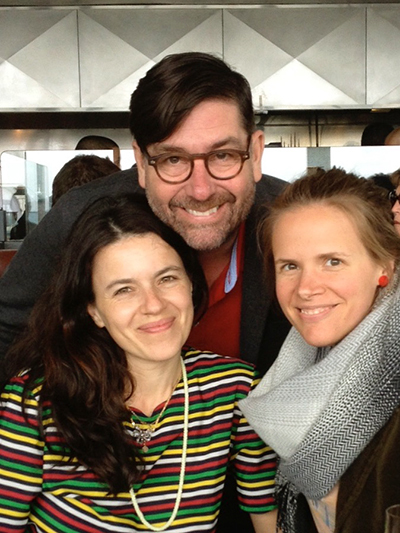 Bea Basso, Rucker, Carly Cioffi, April 2013. "He was transitioning from a freelance career and ready to be embraced by an organization," said Basso. "So we met with that energy." "He had spent so many years floating from one play to the next, one state to the next, and one school to the next, teaching whenever he had a shot," said his sister. "I think he took the administrator job because, one, they created it for him, there wasn't that position before, and, two, I think he really wanted to just have a regular gig." Leslie Rucker knew ACT, having attended its acting conservatory in summer 1984 while a student at San Francisco State University. While at SFSU she met Ford Leary. They later married and had a son, Ford Benton Leary. Then, in March 2006, Leary died unexpectedly at 45. His best friend, Franklin Williams, came from Louisiana to attend the funeral and comfort the new widow and her fatherless 4-year-old. Over the next year her relationship with Williams evolved and she and her son eventually joined him in Baton Rouge. Renting out the San Francisco home she had purchased from Leary and his father before they married now provided additional income, but she kept the "in-law" unit available for family use. During 2009, with her brother now making regular trips north to work at ACT, he had made it his Bay Area residence. On October 2, Leslie Rucker and Williams were back in San Francisco to marry on a stretch of beautiful of beach, surrounded by their families. When they returned to the Gulf Coast, Rucker was now official stepmother to Julien and Max Williams. An internship had put Pelayo in San Francisco that summer and Rucker suggested they spend those months together at his sister's. Both men were busy, with Rucker working at ACT and directing Noel Coward's Private Lives for his friend Jonathan Moscone, the Artistic Director of Cal Shakes and son of the late San Francisco mayor assassinated with Harvey Milk in November 1978. The summer co-habitation was successful enough that Rucker suggested Pelayo move into his L.A. home for the school year. He could keep an eye on the place and they would be together whenever Rucker was in town. It was one of two adjacent properties Rucker and Di Loreto had owned together, but divided. "I had one house and Dante owned the house next door and had renters there the entire time," said Pelayo, whose senior year began as Di Loreto's first television megahit, "Glee," premiered after a trial episode in May. "Their relationship was primarily through text, but always friendly and cordial," Pelayo added. "They exchanged happy birthday messages and so forth." In summer 2010, he and Rucker headed to Europe to celebrate his graduation and the upcoming announcement from ACT. After briefly touring separately they met in Madrid before visiting Paris and then London, where they stayed with Gornick. It was while in London that Pelayo learned of an internship in New York City. "After returning to San Francisco, I jumped on a plane to New York," Pelayo recalled. "But before the internship started we had a week on Fire Island with Danny, Danny's husband Daric, and Patrick Stretch." 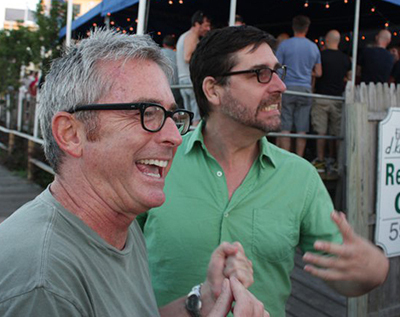 "I think theirs was a very good relationship," said Stretch, who remembered that the week on Fire Island included a film festival that Scheie curated with "all our favorites." "When you're involved in a relationship with a substantial age difference there are issues that come up," noted Stretch, who saw them whenever he was back in San Francisco to visit his family. "Mark would talk to me a little about that and trying to keep up with someone 25 years younger. They clearly loved each other a great deal, and worked through their issues." ACT's August 8, 2010 press release said that Rucker "will take on administrative and producing duties within the artistic department and direct three mainstage and conservatory shows in the coming season as well as teach in the ACT MFA Program." Those directing responsibilities included the mainstage production of Tarell Alvin McCraney's Marcus; or The Secret of Sweet, a workshop reading of Perloff's Higher at the Contemporary Jewish Museum, and an unnamed production with 2011's MFA class that turned out to be Litter by Peter Sinn Nachtrieb. "Mark has enormous breadth, appetite, and passion for all aspects of the theater," Perloff said in the release. "And I believe ACT will give him wonderful artistic challenges both on our mainstage and in our remarkable Master of Fine Arts program." He went to work quickly, sharing an office with Basso and Carly Cioffi, an ACT Artistic Associate from December 2007 through June 2011. Two of the first things Perloff asked him to do worked in tandem: building bridges within the community and directing Marcus, the third play in McCraney's "Brothers/Sisters" trilogy. He coordinated near-simultaneous productions of the three plays with Octavio Solis directing The Brothers Size at Magic Theater and Ryan Rilette directing In the Red and Brown Water at Marin Theatre Company. Both productions were running when Rucker spoke at his design presentation on September 30. "I couldn’t have imagined anything like this happening so quickly," he said. "I am so grateful to Marin and the Magic for collaborating with us, and so proud that I have spent this fall with Octavio Solis and Ryan Rilette working on these plays. It has already brought such enormous goodwill to our community. It means so much to me that this is my first show as Associate Artistic Director. Bay Area Critic Chad Jones applauded the institutions. "The pleasures of the individual plays were many, but the real triumph came in the collaboration between ACT, Marin Theatre Company and the Magic," Jones wrote in his November 4, 2010 review of Marcus. [ 33 ] "The Brother/Sister Plays turned out to be this fall’s theatrical World Series win. There won’t be a ticker-tape parade down Market Street for all the artists involved, but there really should be." "In general he was very excited for the ACT job," Stretch said. "He had never had a full time job before. He had really been a journeyman director, cobbling a living together. ACT kind of changed everything for him because he became financially secure for the first time. And he felt, I think, that he was really truly being useful." "I'd never seen him in a job job," added Scheie. "I didn't recognize him in a way. He was working 80 hours a week and was super dedicated, super devoted to that theater." His final production of 2011 was classic American comedy and classic Rucker. Julia Coffey, Rucker's Hero in SCR's Much Ado About Nothing, played May, the female member of the Vaudeville trio at the center of ACT's Lifetime. She remembered his approach to one scene, perhaps inspired by something in a late night, childhood viewing of Meredith Willson's The Music Man. "The Pullman car set was the most beautiful I've ever seen," Coffey said. "Video projected behind it showed the passing desert before you reached L.A. In rehearsal we did the scene straight, and were getting the hang of the various relationships and plot lines going on. After we ran it Mark said, 'Ok, now add the movement of the train in your bodies.' We all just fell about, giggling with fear. 'We'll look ridiculous!' But he gave us plenty of time to explore it and room to fail and, eventually, it was one of the elements that made that act a standout." Aside from a summer respite at Cal Shakes with Coward's Blithe Spirit, Rucker's ACT project-plate was piled high. Basso was now ACT's full-time Director of New Work and seeing Rucker every day. After getting Once in a Lifetime safely launched in Sarasota, he directed Perloff's Higher, Jordan Harrison's Maple and Vine and "8," The Play, a special event written by Dustin Lance Black. When, in October, Pelayo took a job with Herman Miller in Saugatuck, Michigan, Rucker accepted it as a good career move and they began what would become an 18-month stretch in which, roughly every third or fourth weekend, they alternated originating flights. "In the first seven or eight years it worked really, really well – for me," Augesen said. "There wasn't as much equity for certain of us, but I can't complain: I was treated very well, in terms of the work that I got. It was great, I loved the work. And when Mark got there I had a friend who had my back. He was unflinchingly loyal." But after appearing in those three 2012 productions, tensions with Perloff had reached a boiling point and, said Augesen, "I was fired." For her part, she felt it could be "difficult working for Perloff and if there were problems with anyone Mark was always the one who had to deal with them. He was ever the peacemaker. It can be very uncomfortable not to be in her good graces. Very. Our personalities didn't mesh well, often. I'm surprised we lasted as long as we did." He kicked off 2013 with the regional premiere of 4000 Miles, Amy Herzog's 2013 Pulitzer finalist, at ACT. San Jose Mercury News' Karen D'Souza thought this "rare new play that lives up to its hype" was "beautifully directed." [ 40 ] He received a welcome offer from New Haven to direct A Streetcar Named Desire, and was soon flying east to audition for the Yale Rep production. He cast Augesen as Blanche, allowing her to quickly re-establish on the east coast and earn them each another round of favorable notices. That December, when Pelayo returned home from a work trip to Mexico City, he was annoyed to hear that one of his Saugatuck neighbors was in the house watching television. Tired from the journey, "I walked into my living room and turned the corner very furiously and found Mark looking up. 'Surprise!,' he said with a big smile." There was a bigger surprise for him the next morning when Rucker proposed. The answer was an immediate, enthusiastic "Yes." No date was set, but there was no question they would make it happen. As Pelayo said, "Our relationship was really wonderful." Engaged at home, he engaged at work with even greater enthusiasm. He directed Basso's co-translation of Eduardo De Filippo's Napoli, with Barricelli in the lead. "We were in a really good place then," she said. "In terms of his relationship with ACT and what he was trying to do. People were noticing ACT in a different way because of him – he was the best, sweetest liaison in the community." The Associate Artistic Director was approaching his fourth anniversary at ACT. Pelayo was approaching two years in Saugatuck. Although Rucker was still energized by his role at ACT, he and Pelayo discussed getting jobs in New York. Rucker would need a lot of time to find anything comparable to what he had in San Francisco. Pelayo, however, was able to get transferred to the New York office of Herman Miller in June 2014. The previous summer, UC Santa Cruz, which had spawned Shakespeare Santa Cruz and then supported it for more than 30 years, had announced that it would cut the umbilical cord at the end of 2013. Barricelli and actor/director Mike Ryan spearheaded the "Shakespeare Play On" drive to fund a new company that would begin with a Summer 2014 Season. By February, with help from "such luminaries as Patrick Stewart and Olympia Dukakis … the drive raised more $1.1 million." [ 42 ] Renamed Santa Cruz Shakespeare, with Barricelli and Ryan as co-Artistic Directors, the first three-play season included As You Like It and Merry Wives of Windsor, and Freed's Beard of Avon, the comic take on Shakespeare authorship that Rucker had given its first airing in an in-house SCR reading. Now he was given the honor of directing As You Like it, the production to open SCS's maiden season. "Mark often talked about what a homecoming it was for him because he had gotten his start there and knew how important it was as a space for molding and shaping an artist," said Coffey, who played Rosalind. "At the first day of rehearsal he got emotional talking about it. He felt loved and supported there. Santa Cruz and the Glen held a special place in his heart. He built an homage to the magic of the Glen with that show, and we made it all about spreading love and joy." As the seasons began to change in the east, Pelayo left Herman Miller and moved back to the Bay. "Primarily just to be back with Mark because the distance was too difficult." They would not spend that Christmas together, however. In mid-December, Franklin Williams died suddenly and the Rucker clan gathered in Phoenix to console Leslie and Ford during the holidays, marking Rucker's 56th birthday with hopes for a happier new year. In January 2015, prior to the beginning of rehearsals for Anne Washburn's Mr. Burns, a post-electric play, Rucker did not go into the office. Everything seemed normal at home, according to Pelayo, but Basso was concerned not to hear from him. He returned the following Monday, telling her, "I'm okay. It was just a bump in the road." By the end of the month he was immersed in the multi-leveled Washburn play, helping the author adapt it to a Northern California setting. He was surely inspired by the pop-culture pedigree, in which one of the longest-running television series provided the narrative source to be reshaped by retelling. "The Simpsons" episode Washburn chose was itself the product of evolution through three media. "Cape Feare," which aired in 1993, was a send-up of Martin Scorsese's 1991 Cape Fear, a remake of a 1962 film that had been adapted from John D. MacDonald's novel The Executioners. Following the opening of Mr. Burns on February 25, Rucker's own story was about to take a turn. Pelayo said that they had regularly talked about the wedding and seriously attempted to organize it at one point. "But we both realized it was difficult for either of us to take initiative and really do proper planning." In February 2015, Pelayo "had a little bit of a panic attack and I suddenly wasn't sure if I could do it." After Burns opened, he suggested they talk about it and Rucker agreed. "Yeah, I think that we should talk." "After a long conversation I think we both decided maybe this is done," said Pelayo. "Mark was always genuinely sweet, and said you can still sleep here tonight. But I was like, I don't know if it works that way, and packed a bag and went to a friend's place." They began "a couple months of respectful silence" following the split. After Mr. Burns closed at ACT in March, Rucker went to Minneapolis to oversee its remounting at the Guthrie Theater. It generated another round of appreciative reviews. By Spring 2015 it was becoming clear to friends that he was increasingly anxious about the administrative workload at ACT and personality differences with Perloff and what he should do. One friend thought it was making him depressed and that "he didn't want to be there anymore and had begun looking for other options." In June he took off another week unannounced, probably for two job interviews he had scheduled that month. One was the Artistic Director position at Cal Shakes, which would become available later that year after Moscone departed. The other was a teaching position at Yale. During the trip to New Haven he stayed a night in New York with Stretch. June 28th was the 65th Anniversary of Lester and Norma Rucker's night drive to Nevada and teenage wedding. His sister had made the difficult decision to tell her mother she would not be joining the planned celebration. Still grieving, she was busy running Williams' tree care business and trying to console a boy who had now lost a father and stepfather before the age of 12. "I'd said I absolutely can't come and she'd given in to it," she said. "But Mark would drop anything to go to my parents and he talked me into coming. Ford and I showed up and completely surprised my mom. It was a huge deal, all thanks to Mark." He spent that July 4th weekend with Annie and Bill Macomber and his goddaughters Dorothy and Caroline. From the rooftop of the historic registry home they watched distant bursts of fireworks above communities scattered across the L.A. basin. Later that weekend he chaperoned Dorothy to Inside Out at El Capitan. It was the first movie theater experience for Rucker's first goddaughter, someone he helped in naming. According Weisman Macomber, "I was thinking about naming her either Emelia or Dorothy, and he was like, 'Absolutely Dorothy.'" "It was really sweet for Mark to take her because he was such a movie lover," she continued. "And we loved going to the El Capitan because it's the great old L.A. movie theater and they have the curtain and it's really the way movies used to be: the way he loved them." During the weekend he told her he did not get the Cal Shakes position. "He really did go for it, and he was disappointed," she recalled. "But also understanding. Mark was not a resentful person, ever. I never heard him say one bitter or resentful thing. He was just very understanding about things. And empathetic." Back in San Francisco, he was looking forward to seeing Gornick and Edwards during a trip to Berlin and London during the second half of July. "After not seeing each other for a couple months we decided to have dinner," Pelayo said. "He looked great and was very much like the Mark that I'd met. He told me that he was taking care of himself and was going to the gym again and seeing a therapist and only drinking wine. It made me think we made a mistake, and we both cried and had to admit that splitting up was a very good idea on both parts, that we had stuff to figure out and there was no reason to jump right into things. But we discussed the potential of getting back together: that once we figured out these things we needed to work out, we could see how things go." Rucker asked Pelayo, an admitted tech-nerd, about the best headphones for his upcoming trip. The choice was clear, Pelayo said, but costly. Before Rucker flew to Berlin, Pelayo surprised him. "I gave him the expensive headphones I had recommended and I think he was blown away. He wanted to give me half the money, and I said no, this is really a gift. We spent an hour going through syncing and downloading questions. It was really very special," Pelayo said. After a few days alone in Berlin, Rucker flew to London for a reunion with his Holman housemates. His two-week stay with Gornick was capped by Edwards' arrival two days before he returned to San Francisco. Gornick recalled he seemed anxious about his relationship with Perloff and ACT. "He was very worried about his nephew and committed to playing an active role in his life," she said. "But he was not planning to leave. My understanding was that Leslie and Ford were moving to San Francisco to live in the same house with Mark. "We were making plans," she continued. "The three of us were going to meet in Sarasota for Mark's birthday in December. He was really looking forward to Ah, Wilderness and had done so much work on it while he was in London. And then there was the amazing thing of Peter Nachtrieb's that he and Danny were doing about the family mansion tour guide. And Mark loved San Francisco and loved working with Danny. [ 49 ] They were just so fabulous together: The stuff that was ahead of them to create was just incredible." Edwards remembers the conversations were "filled with ideas about the future. I thought he was tired, exhausted, but we talked constantly about the past, the present and the future and what we were planning on doing." While in London Rucker had continued preparations for his staging of Ah, Wilderness!, which would open ACT's 2015-16 Season that September. He and designer Ralph Funicello had began discussing the scenic look of the production while in Minneapolis getting Mr. Burns into the Guthrie. Because he'd already designed Ah, Wilderness! for ACT in 1978, Funicello was only interested "if we approached it in a way that was not 'realistic,' but was more of a romantic memory." "He said that was exactly what he had in mind," Funicello said. "He approved the design in early August, and the set that appeared on stage in the fall was the one that he and I had worked on together." Back in San Francisco, Rucker shared with Basso and others his wish to return to freelance life. "I can't tell you how happy I was," Basso said. "'That's great, Mark,' I told him. It was actually a beautiful phone call." Indeed, the freelance world was ready to welcome him back. In June he and Scheie had started work on Nachtrieb's House Tour, the one-man show Gornick had mentioned, at Berkley Rep's Ground Floor summer development series. They were set to pick up again on Tuesday, August 25. "We were using Z Space at Theatre Artaud in the Mission," Scheie said. "The producer was Lisa Steinler and Mark and she were cooking up all sorts of stuff. Mark told me that he was really happy to be returning to the more alternative or avant garde work, because ACT was a little bit more establishment, with big huge productions. He enjoyed doing those too, and was very good at them, but he was happy to be back doing a little more renegade stuff." On Sunday, August 23, just back from a press check in Nashville, Pelayo checked in to say he was back, and exhausted. They exchanged a series of affectionate texts about seeing each other soon. Edwards called that afternoon from the Stratford Festival, and they spoke for several minutes. Edwards was heading into an evening performance and had to cut the call short, but they agreed to speak the next day. On Tuesday morning, Rucker did not pick up Scheie for their pre-rehearsal breakfast or arrive for the House Tour rehearsal. Scheie called Edwards in Florida and asked if he'd heard anything. Edwards called Pelayo, who hurried to the house they had shared, stopping to get the spare key from the woman renting the main house. The in-law's front door was unlocked. He called out, then made his way through the silence to the bedroom. Rucker was lying on the bed, but unresponsive. Paramedics were immediately called, and shortly after they arrived set the legal time of death at 4:44 p.m.
Rucker had trouble sleeping. It was not uncommon for him, especially if he were wrestling with a challenging play, to retreat to the patio in middle of the night for a cigarette. He was not really a smoker and neither was Pelayo, so he maintained a self-imposed rule never to smoke in the house. In the predawn hours of Tuesday, August 25, the tenant was up breastfeeding her baby and heard him having a cigarette out in the yard. He returned to the house and in all probability was still unable to get to sleep. Wanting to get some rest before the important rehearsals later that day, he likely decided to now take a sleeping pill, as he was also known to do when a cigarette was not enough. Suddenly things that had not been uncommon – alcohol from the previous evening, his anti-depressant medication and a sleep aid – became overwhelming in this combination. In the report he issued four months later, Dr. Harminder Narula, Assistant Medical Examiner in the San Francisco Medical Examiner's office, confirmed that the "manner of death" was an "accident." In his October 2016 phone interview, Pelayo agreed. "In my mind it was completely accidental," he said. Upon request, he scrolled back to the messages he had saved from Sunday, August 23, 2015. He read their last exchange and came to the final text. "I think about you," Rucker had written, "and smile when I think about you dancing." 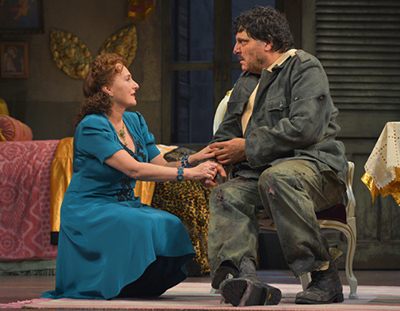 People in the American theater enjoy relatively few degrees of separation. Introductions on first days of rehearsal remind that it's a small world. Then a table read, with its fresh mix of voices and ideas, reminds that each new production offers infinite possibilities. That blend of intimacy and opportunity drove Mark Rucker's three decades of work. He understood that successful storytelling, whether lit by a campfire or a Broadway designer, is rooted in human understanding. Rucker combined a scholar's grasp of theater and film with near-rabbinical empathy and insight. His ability to ease an actor's essence into the hollow of each playwright creation went beyond theater directing: it was the alchemy of character. Rogers, Rogers and Rucker … Tap training. In the late afternoon of January 10, 2016, about 130 friends and colleagues who had been transformed by Rucker and his art were seated in the Signature's Jewel Box. Catherine Sheehy and Jennifer Kiger, Yale Rep's Associate Artistic Director and a friend of Rucker since her years as SCR's Literary Manager, welcomed them to "We've Just Said Hello: A Celebration for Mark." They assured the audience it was to be a celebration. To begin the program they called upon Reg Rogers. Over his protestations that he was not a writer, Sheehy had encouraged him to write something. It began with that strange initial meeting, how nascent high school loyalties had put them at odds until a bar logo on a windbreaker permanently united them. Julie Fain Lawrence and Malcom Gets, two more cast members from Rucker's Stage Door, performed a beautiful musical number, then surrendered the stage to Rucker's best friends. Danny Scheie and Patrick Stretch read a specially written comic dialogue entitled "You'd Do All That For a Part in a Play?" Stretch then spoke of "the great pleasure of calling Mark one of my best friends for over 30 years" and Scheie recounted their meeting in 1985. He then read "the Kansas segment" of the famous Santa Cruz to New Haven diary, introducing it by explaining, "We were in a beat-up Honda Accord without a radio. I read every page of Andy Warhol’s diaries aloud to him, and then Mark made me write our own diary of that trip and ultimately many others." After a beautiful, emotional speech by Jonathan Moscone, Michael Manual arrived on stage. Manual, another Stage Door cast member, who married Roxana Augesen shortly after graduating from Yale, appeared in drag to sing Cher's "Gypsies, Tramps and Thieves." According to his sister-in-law René, "It brought down the whole house"
Charles Busch thanked Rucker for the career highlight of filming Die Mommie Die!, and introduced a clip. Susannah Schulman Rogers then read a loving tribute to the man who "gave me my first professional theater job, gave me the job that got me my Equity card, and was my introduction to most of the theaters in which I've worked." Most of her dearest friends were met, or transformed from colleagues to friends, through working together on one of his shows, she said. And, it was by being in orbit within the small world held together by Rucker that she kept crossing paths with the love of her life. Tom Beckett, the actor whose banjo-playing had so impressed a Triumph of Love reviewer in 1997, accompanied himself on ukulele as he sang an excerpt of King Lear to a familiar television theme. The program concluded with a slide show of production and personal photographs going back to the UCLA days, ending with an image of the tap dance finale from Rough Crossing. Out in the audience, three of the show's six dancers – Adria Vitlar, Adina Verson and Stephanie Fittro – now stood up. "We hurried onto the stage," said Fittro, "and joined the speakers for a chorus of 'Where Do We Go from Here.' Then we told the audience what we wanted them to do. I gave a short lesson on some simple steps and arm movements.'" The dancers demonstrated how the audience could simply stand in place and, as Fittro instructed, do some "simple win-dow-wash-er movements" to the rhythm along with toe taps and clapping in place. Though there was concern during the afternoon rehearsal that the people weren't going to do it, "people were so into it," she said. As hoped, the song magically ended with all arms thrust up in unison salute. "The last lyric is 'Where do we go … When do we go … darling I'm so, ready to go …' And then the music went through several ascending eighth-note runs as we finished our steps, then planted, looked upwards, and shot our arms up high as we sang out, 'Mark!'" Stretch said, "It felt like we had summoned up the spirit of what Mark meant to all of us and communicated that and rejoiced in it. And at the end of it many of us held a kind of elation because we felt like we'd really given him a proper send off. It was a celebration of him and that's what we wanted to do." "I think the whole thing was exactly in his spirit," said Augesen. "It would have made him smile and laugh and cry and I don't think he could have asked for anything better. He would have loved it." Following the crowd-dancing finale, most of the audience moved across the Signature lobby to its café bar. Annie Weisman Macomber promptly hoisted a glass to the first man she called husband, and gave a toast to kick off a couple more hours of looking back misty-eyed, but looking ahead more clearly. It was 10 o'clock when the last of them stood before the 42nd Street entrance to the theater, tightening farewell embraces with promises to stay in touch. The one-afternoon heat wave was gone and winter had reclaimed its season. But there was uplift in the circles of friendship dispersing into the night. The sense of loss had not diminished. It never would. But celebrating and sharing had eased its grip. Something real and entirely of Mark Rucker's making had come into the hollows created by his passing. It was warm and it lit the way as they headed for home. 31. 'Marco Barricelli is exiting, with O'Neill's 'Moon' showing the way out', Sam Hurwitt, SFGate, April 27, 2005. 32. Words on Plays: 'Marcus; or the Secret of Sweet', ACT production publication. Excerpts from Mark Rucker's remarks during Design Presentation on September 30, 2010 (pps 20-22). 37. 'All Talking! All Laughing', by Terry Teachout, The Wall Street Journal, February 10, 2012.